When I first began studying online life in the early 1980s, I saw it as a place where people had an opportunity to express aspects of themselves that were typically repressed in their daily life. Back then, they did this in simple online chat rooms and, more elaborately, when they constructed game avatars. In those days, I was something of an enthusiast, trying to alert clinicians—psychoanalysts, psychologists, psychiatrists, social workers, and pediatricians—to the importance of these new digital spaces. In particular, I hoped my work would make psychotherapists more comfortable with technology and make them feel that they had a role to play in its development. In essence, my message to psychotherapists was this: here’s a technology that functions as a kind of intimate machine and touches deeply on questions of identity. Watch for it as you do your work. In your practice, when clients talk about their web pages, their desktop designs, their avatars, they’ll be talking about matters that reach far beyond the technical. Digital life isn’t a realm of culture whose elaboration and interpretation should be left to engineers. We need therapeutic practitioners to understand its deeper dimensions. Through the mid-’90s, my writings about technology and self were mainly hopeful about the psychological impact of digital culture. Indeed, in 1996, I was on the cover of Wired magazine for my work portraying online avatars as part of a new kind of “identity play” that expanded people’s sense of themselves. Ironically, that cover story appeared just as I was changing my mind about where we were allowing technology to take us. I had two related concerns: we expected more from technology and less from each other. We were increasingly willing to talk to machines, even about intimate matters. And increasingly, with the rise of mobile devices, we were paying attention to our phones rather than each other. In both cases, there was a flight from face-to-face conversation. In both cases, technology was encouraging us to forget that the essence of conversation is one where human meanings are understood, where empathy is engaged. These technical proposals were seductive. 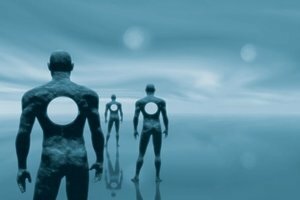 In my studies of artificial intelligence, I interviewed hundreds of people across generations who, in the course of the 1990s and early 2000s, warmed to the idea of robots as friends, of computer programs as counselors. In this, they were not only willing to take the simulation of understanding as genuine understanding, but the simulation of feeling as feeling itself. Consider a high school senior who told me that a computer program with artificial intelligence would be a better resource than his father for talking about girls and dating because the program would have so much more “information” and “cases” to work with. What an artificial intelligence can know is your schedule, the literal content of your email, your preferences in film, TV, and food. If you wear body-sensing technologies, it can know the degree to which these things emotionally activate you because it may infer this from physiological markers. But it doesn’t understand what any of these things mean to you, because it’s not judging them from the point of view of being human. Our willingness to talk to machines is a part of a culture of forgetting that challenges psychotherapy today. What we’re forgetting is what makes people special, what makes conversation authentic, what makes it human, what makes psychotherapy the talking cure. These are some of the consequences of expecting more from technology than technology can offer. I’ve also said that in our flight from conversation, we expect less from each other. Here, mobile communication and social media are key actors. Of course, we don’t live in a silent world. We talk to each other. And we communicate online almost all the time. But we’re always distracted by the worlds on our phones, and it’s become more common to go to great lengths to avoid a certain kind of conversation: those that are spontaneous and face-to-face and require our full attention, those in which people go off on a tangent and circle back in unpredictable and self-revealing ways. In other words, what people are fleeing is the kind of conversation that talk therapy tries to promote, the kind in which intimacy flourishes and empathy thrives. In this cultural environment, what happens in the consulting room? When I talk to therapists, they tell me that clients today find it harder to concentrate on face-to-face conversation. They may not even see its value, feeling more comfortable with the self they can present on their screens. And in the spirit of the robotic moment, they may be comfortable with apps on their phone that, for them, serve at least part of the job that therapy once did. Rather than relating directly to a real-life therapist, they use apps in which you tell your story, and apps that analyze it. They’re drawn to apps to calm you down and let you know if you may be guilty of distorting your cognitive field. We now face a generation of clients who may need talk therapy in order to be schooled in the very rudiments of emotionally revealing talk. The basic work of therapy is now the work that’s most needed: sitting quietly with a client, giving that person your full attention, creating a space to pay attention to one’s own thoughts and to listen to another. Making the point that these things are important is a point that life today doesn’t make. Conditioned by the experience of life on the screen, people’s expectation is that the world will come to them in a constant, steady stream. Solitude becomes painful. At a stoplight, at a line at a supermarket, you see people turn immediately to their phones. As a culture, our capacity for solitude is challenged by the culture of the continual feed. The culture of therapy affects our culture as a whole. How we seek help, what we expect help to look like, changes our values in a broader way. 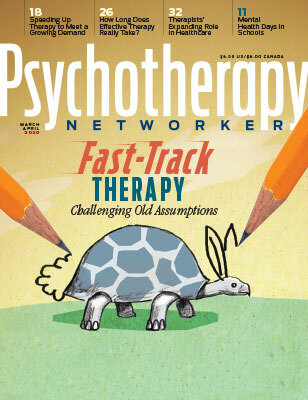 Right now, digital culture closes down the questions that talk therapy knows how to open up. The mores of therapy—the value it places on being with, forming an empathic bond, and the quiet attention necessary to do this—become more central as a cultural corrective. If therapy once allowed patients to develop the capacity to talk about sexuality in a way that was prohibited outside of the consulting room, now there’s a new imperative: to experience solitude and an experience of quiet, empathic connection. Digital connection is a way to keep my job simple and my life tidier. We have to remember why it’s important to be the messy, complex, people that we are. We have to support each other in remembering that the kind of conversations that may seem old-fashioned are actually, of our moment, and most necessary and essential. And all the more essential because they can be portrayed as superseded by something faster, cheaper, and more precise. What therapists need to recognize is the reason we need to talk: to forge relationships that are the triumph of messy, breathing human connection over the cold instrumentality of treating each other as apps. Sherry Turkle, PhD, is Abby Rockefeller Mauzé Professor of the Social Studies of Science and Technology at MIT. Among other books, she’s the author of Psychoanalytic Politics: Jacques Lacan and Freud’s French Revolution and a trilogy of studies of people and their relationships with technology: The Second Self, Life on the Screen, and Alone Together. Turkle is a licensed clinical psychologist. This blog is excerpted from "The Empathy Gap" by Sherry Turkle. The full version is available in the November/December 2016 issue, The Next Big Thing: Psychotherapy and the Virtual Revolution. You have hit the nail right on the head with this piece. Amidst all that buzz about how the digital age has allowed you to stay in touch with people living miles apart, it has somewhere created an empathy gap. You may sit at your computer for hours, read hundreds of articles and watch thousands of movies but they can never replace talking to someone you are close to. You open up when you talk and that is what a person going through a difficult time needs more than anything else. And unfortunately, despite all the new-age tech, there is no app for forgetting yet.